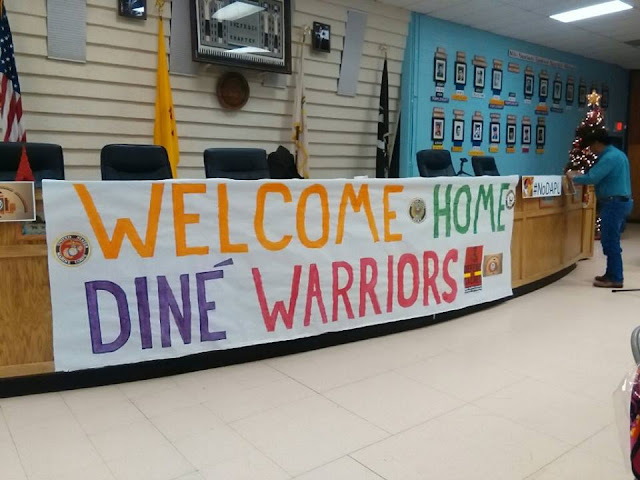 Shiprock Chapter ready to welcome home Dine' Warriors tonight. Photos by Redawn George. 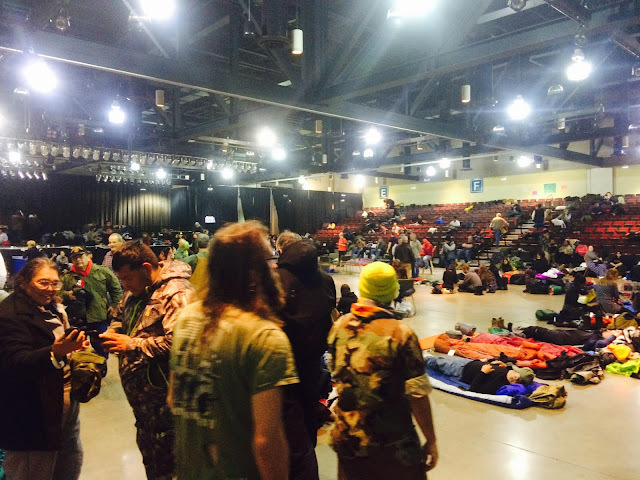 Gyms and the Pavilion at the casino opened their doors to water protectors and Veterans during the blizzard this week. Dec 9 am Dine’ Warriors for Standing Rock Update: our Dine’ Warriors rolled into Shiprock about 8:45 last evening. After they deboarded, unloaded their gear, we proceeded to assure their good transition back to our homelands with Dine’ traditional observance that reenacted the coming home ceremony of the Warrior Twins. The five part ceremonial process completed their coming home within the four mountains. The ceremonial process was finished with a beautiful song of honoring and being thankful for our lands by one of esteemed young people, Nicole Keeswood. We gave them words of appreciation and admiration for their journey to represent the Dine’ people at Oceti Sakowin at Standing Rock Sioux Tribal territories. The call to stand arm in arm with the thousands of other Veterans of the US military was answered by these Vets with support from our own Water Protectors. After these short talks we had a delicious potluck dinner provided by community members. Some of the Dine’ Warriors recounted their experiences in Standing Rock. We gave thanks to our spiritual leader, to Nicole, the leaders of the journey - Beverly Maxwell, Anthony Aspaas, Ronald Daw and Alex Ashley, our recruiters - Angie Barney Nez, Eunice Begay, Anderson Tullie and Julius Tullie, our homebase coordinating crew - Redawn George, Tommie Yazzie and most in particular Josey Foo whose 501c3 non-profit received the funds that financed the trip and Josey was the pivotal point in the overall coordination including transportation, lodging, food, etc. And we are truly indebted to the National Nurses United, whose funds made it all possible. So this portion of our Stand with Standing Rock is done, but as we are all very aware the fight will go on and we must keep in prayer our Warriors that remain at Standing Rock. 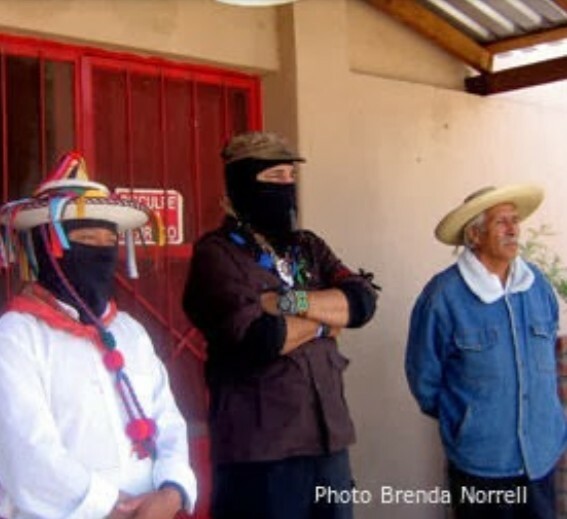 We have been resisting since 1492 and we shall continue to resist in perpetuity defending our homelands, waters, our people and our grandchildren to come. In recognizing that this is our fate in life as Indigenous peoples and all people with good hearts, there remains a sense of urgency to be vigilant and hold that line we draw in the Rez dirt. I hear many people say they want to go next time, there WILL be a next time, whether it be at Standing Rock or right here in our own front yard with Pinion Pipeline or the dooda uranium front, the continuing nightmare of Black Mesa exploitation or the fight to protect our waters. Dear family, there is much that remains in our fight to preserve our Earth Mother and waters, we have no option but to stand strong together and be that bundle of arrows unbreakable. Ahe’hee. Dec 8 at noon -- Dine’ Warriors for Standing Rock Update: our Warriors are on the road and headed home, with the time zone difference that helps, although the earliest they will roll into Shiprock is 8:30, so they should be in the house at 9:00 pm. We are making the call for prepared foods to do the potluck dinner. There are families from across the Rez that are planning to be here to join in the Welcome Home celebration and to pick up their Warrior. I will post again about 6pm with any new developments and see if can pinpoint the arrival time. Either way those who are going to here, should be at the Shiprock Chapter House at 8:00pm. Dec 8 am Dine’ Warriors for Standing Rock Update: our Dine’ Warriors did not get into Colorado Springs until 4:30 this morning. The drivers have said they will not get on the road until 1:00 pm, which will push our Welcome Home gathering/potluck into the late hours, even past 9:00. Nevertheless we will be here for them, they represented us at Standing Rock; we will show our appreciation. Certainly we will ask the drivers and their coordinators if they would consider leaving earlier, I will post at noon with any time schedule adjustments. If families from Chinle area and other locations can arrange rides to pick up your Warriors in Shiprock, we will help with gas to get you home. As I reported 3 of our Warriors stayed at Oceti Sakowin, they made a personal and courageous decision that we respect and honor. I am asking to know how many of our Dine’ remain there in the brutal winter, I know Graham and some of his cohorts are still there and don’t expect to leave camp any time soon. There are comments that were made about why did our Warriors go for only a couple days, why not let some of them stay there to support the Oceti Sakowin for the long term, as we know this thing ain’t over. That is a difficult matter to think on, particularly when we hear the Chairman saying “thank you but you should go home”, this is said partly for the safety of the people and that is appreciated. Then we hear from determined Warriors who declare that they will not leave until the pipeline is dead. The main objective of our Dine’ Warriors in the last couple of days was to have some of our Veterans stand with their comrades on December 05 and that was done. Many left their jobs and their family responsibilities for only a few days and weren’t prepared to stay an extended amount of time. We should not question ‘how much’ we are committed we each are; we are committed because it’s a matter of life, the realities is we all have our own life responsibilities, our hectic work and many times difficult life situations. There is much to be discussed on this, but for now we must celebrate our Warriors who return to their homelands tonite. 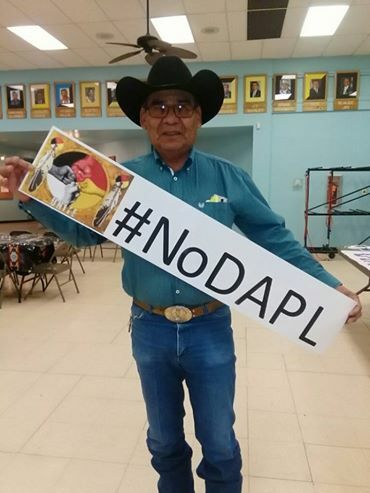 Dec 7 evening – Dine’ Warriors for Standing Rock Update: our Warriors are headed to North Platte, Nebraska and scheduled to roll through Denver about 1-2:00 am tonight, onto Colorado Springs where they will get rest. Unfortunately they will not be able to do dinner at the Denver Indian Center, thank you Susie, Davina, Felicia, and the Denver Native American community for wanting to make that happen. The plan is to leave Colorado Springs tomorrow morning and come home either through Wolf Creek Pass or the Dulce route, either look ok. We are truly hoping they will get back to Shiprock by 5:00 pm. We plan to do a Welcome Home gathering for them with a delicious potluck dinner, so bring a dish. Headcount is 42 total and 3 of our Warriors stayed at Oceti Sakowin. We invite everyone to join us welcome home our Warriors. Dine’ Warriors for Standing Rock Update: our Dine’ Warriors are still in Pierre, South Dakota, with the drivers getting their mandatory 8 hour rest. They should be on the road to Denver this afternoon about 3-4:00 pm/ They will get into Denver late, so they will continue on to Colorado Springs where we will motel them. They will leave Colorado Springs early tomorrow, they plan to go thru Chama and Dulce (anyone know road conditions that way?) rather than go over Wolf Creek. We project they will be in Shiprock tomorrow around 5:00 pm and not Friday like I said this morning. I have reserved the chapter house for a Welcome Home Gathering for them, we ask all who can help with prepared foods to please help, Rez potluck. I will post a more precise time in my morning post tomorrow. Again we encourage families of Warriors to come to Shiprock and help us do the welcome and to pick up your Warrior. 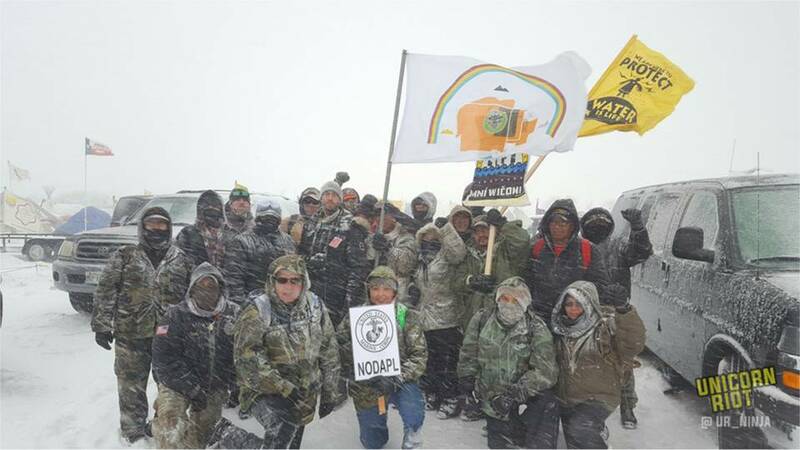 Dine’ Warriors for Standing Rock Update: very difficult to get communication in and out of Oceti Sakowin. Communication difficulty due to terrain, weather, maybe network overloads and for sure the government/corporation’s deliberate jamming of the air waves. With the last communiques I got from Beverly and Vincent Yazzie, they are making effort to regroup to move out tomorrow, our crew had gotten scattered out, some are camping at the casino, some are back in Kenel and a few in Ft. Yates, I hope everyone is accounted for. Kenel is the staging area for Rez bound transportation and Beverly’s got it arranged for everyone to get back to Kenel in the morning. The plan is for our Dine’ Warriors to move out in the morning, of course weather and the road conditions permitting. If that plans stays, they will be in Denver tomorrow evening chowing down at the Denver Indian Center. A big ahe’hee (thank you) to our Denver family. They will stay in Denver tomorrow evening and head out for the Rez-Shiprock early Thursday morning. We will have a potluck Welcome Home celebration Thursday afternoon about 4-5:00. We will post the specifics as soon as plans are solid. Perhaps families of Warriors can plan to come to Shiprock to pick up your Warriors and celebrate with us. Again, this all depends on the weather and the roads. With regard to the seeming conflicting positions of breaking camp and going home or staying and keeping camp by some of the fearless Lakota Warriors, seems to point to the same distrust some of us Indigenous peeps have of Tribal elected leaders in the colonized system. We pray that for the sake of our ultimate cause, that the Solidarity that has been achieved is only built on to make it stronger. And with the pipeline executives saying they will proceed with the pipeline in spite of what the Army Corps says, hopefully might lead to a scene where DAPL forces face off with the Army Corps, who supposedly have issued a 'lawful' decision and we’ll see what the sheriff does with his declaration that he is there to enforce the law. Sounds like a good fight we will enjoy watching. Easier to stay warm in the cold than to stay cool in the heat. In the intense heat the lake water is hot. City humans are dying from the heat waves due to climate change made worse by fracking. Be thankful for the cold, warm clothes, food, hot tea, maybe a sweetie! So,Who was responsible for setting up winter camp anyway? Must burn alotta wood in winter. Heat wave in India killed 2,300 people in 2 states (2015). there were 330 million people affected by the heat wave and many deaths. People died in the intense heat while trying to get water. In Karachi, Pakistan, 1,300 people died from the Heat and water scarcity. Heat related deaths have increased in the USA. Why would anyone replace HOPE with Disappointment ? Main Stream Media was there for a minute, & Whoosh, just brushed Standing Rock under the rug. They are making jokes & laughing at the 'casino' injuns. So, everybody wants to know what's going on with Standing Rock? Who put the doubt? "When the night has come and the land is dark in the Moon is the only light we see no I won't be afraid no I won't shed one tear just as long as you people come and Stand By Me and darling darling stand by me Oh Stand By Me Oh stand stand come on Stand By Me"
What will we do for the water and she does so much for Us? "No matter who you are, no matter where you go in your life, at some point you're going to need somebody to stand by you. Oh yeah oh my darling stand by me. Yeah, ND & DAPL are rumoring around how they got to get the Indians to back down. "We just wanna get the Indians outta there. We want the whole thing to go away." DAPL wants to build their pipeline without opposition. !Standing Rock just got PUNKED! The Media coverage makes Standing Rock look like half melted pudding pops, or soggy corn flakes. The Vets kneeling for forgiveness? Don't like saying this but celebrating during a blizzard? Amy, sounded like a concession speech not a victory speech. Telling people to get out. He could of said "Now we are going to take care of the Water Protectors that have injuries, at camp, the ones in court, and the ones still holding it down here and in other places. Will you be supporting the Water Protectors? You may have a home & holiday party but not everyone has a home to go to and no party either or car or even food or doctor. Can't hardly believe at this point we would have to put into words, sad words. Never thought of it this way.makes total sense, I was not feeling it on his removal stance.I can't help but think of that young medic Sophia that had her arm blown off by a concussion grenade. Its said that she was scared that they would come and kill her.